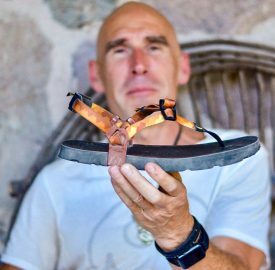 LUNAs Sandals, known for high quality, made in the USA running sandals, has released their highest performance sandal line to date. The new Winged Edition LUNAs feature flexible, durable Performance Wings to provide the simplest, most precise, secure and comfortable LUNA experience yet. While many other sandals have posts on each side, those posts inhibit the adjustability of the sandal. LUNA has solved this problem by simply extending their original lacing system up through the wings rather than around the sole of the sandal. The LUNA laces remain movable through slots on the wings, until locked into place. This maintains total adjustability in every portion of the sandal! “Like surfers making surfboards, by being embroiled in the process of crafting footwear for over 10 years, we struck pay dirt. Our new Winged Edition Line makes available to the world the most comfortable, easy to use ‘everything you need, nothing you don’t’ sandal ever made,” said LUNA Sandals Founder & President, Barefoot Ted McDonald. LUNA is adamant about simplicity and clean lines, which is why their new models seek to embody, “the simplest design that works the best.” With the implementation of Performance Wings, the previously necessary ankle ‘tech strap’ has been made obsolete – creating the easiest user experience yet. In addition to a thoughtful redesign of the classic lacing system, LUNA is, for the very first time, introducing new colors and outdoor inspired patterns into their performance line.